For the second time in her career, Kim is part of Team USA for the ITU World Triathlon Championships. The 2012 staging of this event is being held in Auckland, New Zealand, so we're traveling there to cheer her on in her race. We left from San Francisco on Nov 16, and after brief layovers in Los Angeles and Tahiti, as well as crossing the International Date Line, we arrive in Auckland midday on Nov 18. The SFO-LAX leg is on Virgin America, with free onboard wifi ... cool, my phone sends/receives texts and emails in-flight! The latter two legs are on an Air Tahiti Nui Airbus A320, and I'm impressed with how quiet this plane is relative to the Boeing 747 we traveled aboard to Australia three years ago ... though I wish I could get more than 4 ozs. of Coke when the flight attendants come by with in-flight beverages. 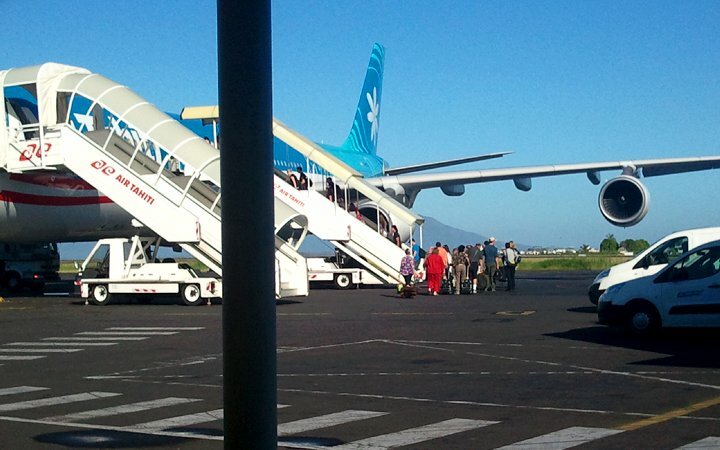 Changing planes at the Tahiti airport. With a non-stop flight, Kim has arrived in Auckland several hours ahead of us despite leaving San Francisco a few hours after us. Although three international flights arrived together, the line through Customs moves relatively smoothly, and New Zealand immigration officials are warm and friendly. Then we head for the rental car booth to meet another cheery, helpful Kiwi. We pick up our rental car and gingerly head out onto the roadways, remembering to keep to the left side of the road. Our hotel is about a half-hour away in downtown Auckland, and we finally get there a couple hours later. It turns out navigating Auckland streets is a nightmare! Streets don't follow a grid-like layout, but meander around from north-south to east-west and even back to south-north! It's hard to tell whether you're heading toward or away from your intended destination. Intersections are a mishmash of horizontals, verticals, and diagonals--which then turn and go in a different direction once you've turned onto them. Also, without warning the lane you're in might suddenly turn into a left-turn lane or a right-turn lane or a bus-only lane. Despite a week of attempts, we never managed to simply drive around the block and end up where we started. 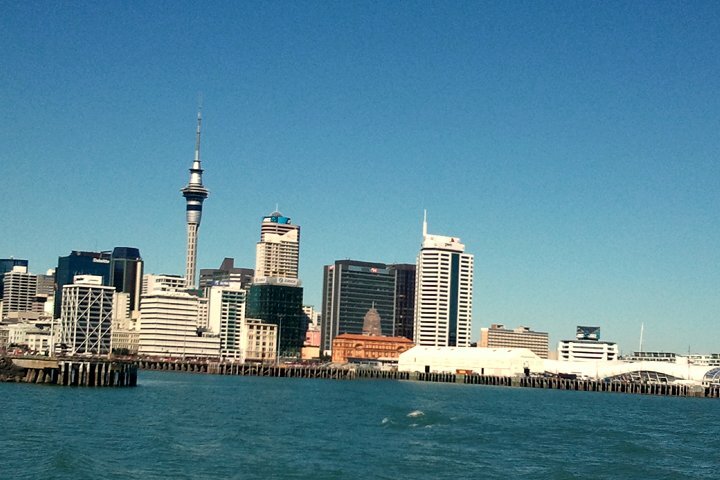 The Skytower, New Zealand's tallest building, looms over the Auckland skyline. The triathlon's transition area is on the middle wharf below the Skytower. The grandstands and finish chute are near the white building on the wharf to the right.